Why Should You Attend a Trade Show? 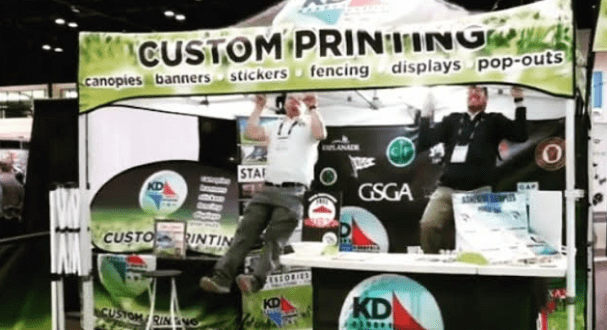 Last week we kicked off the 2019 trade show season by attending the PGA Merchandise Show in Orlando. What a great time. We always love connecting with some of our past clients while visiting with current clients and networking with those we will serve in the future. It got us thinking about the importance of attending trade shows, not only to help you and your career but the business you work for. Think about it. A trade show boasts industry experts and enthusiasts who know a thing or 2 about promoting their business. Once you get past the issue of the traveling and registration costs, imagine how much you can collaborate, develop new skills, gain knowledge and of course, network. Making the choice to attend a trade show will deeply impact you and your company, we highly recommend it. There are many reasons why you shouldn’t miss out! Here’s a few. Raise brand awareness-catch the passerby’s with standout graphics. Learn about new trends in your industry-change can be good. Find new products, new markets, new opportunities-the time is now! Get ideas for your business-the possibilities are endless. Compare products and suppliers-how is your product better? Network with potential customers-make a lasting impression. Scope out the competition-how do you do up against the others? Find answers to questions you may have-communicate with other businesses. Have fun-soak up all the good energy! Begin your search now to find the best trade shows for you to attend and stay tuned for where to find us next.